Last week I wrote my first blog about entering the world of Crypto Currency trading, suggesting investing 5U in Ethereum. I freaked out a bit when Bitcoin and Ethereum crashed a few days later but Ethereum is back to pre-crash levels now and the financial analysis of how Ethereum reacted to that adjustment was really positive (basically it showed it’s in a strong position). Anyway, I wanted to write a blog about how to invest in the smaller, growing currencies. It’s all well and good hoping on at $350 and hoping to x3 your money over a few months but obviously what you really want is to jump on a really good project on the ground floor (or at least not floor 350) and hope for a x10 or x100. Whereas investing in Ethereum is really easy (you just join coinbase and buy some), unless someone actually explains how to buy the smaller ones, it’s a bit of a head scratcher. So here we go; a quick how to (and why you should bother). Well, there are hundreds of altcoins (basically a name for smaller crypto currencies). A lot of them are just bitcoin rip-offs which are nothing more than a currency but a lot of them are platforms for interesting (and potentially world changing) projects. To recap a little bit – the concept of the “blockchain”, which cryptos are based on, is essentially combining the resources of all the computers that power that blockchain. Whether that is literally using their CPU processing power or using the hard disk space of the computer, it provides many opportunities for a different way of doing things. Vastly reduced costs of cloud storage, giant super computers similar to e.g. the concept of the Square Kilometre Array Telescope, if you know what that is… I feel like this is a once in a lifetime occurance. That’s why I’ve gone all in on this for the last couple of weeks. Why Bother Investing In Altcoins? Well if Bitcoin was phase 1 of the blockchain concept, Ethereum is phase two and all these smaller ones now are phase 3. Without 1 there couldn’t be 2 and without 2 there couldn’t be 3. A lot of the phase 3 are built on top of Ethereum. Some of them are alternatives to Ethereum. I really doubt they’ll get up to that sort of price, but we really don’t need them to because we’re looking at basically the equivalent of penny stock. *edit 8/8/17. I have personally changed what I’ve invested in now, away from this article and onto my own opinion. I now own BAT and NEO. I do still like Stratis. I do not really like Siacoin anymore as I think they’ll get out-done by Filecoin. Use that link above and they’ll give you $10 free bitcoin. Coinbase is basically the equivalent of Paypal; going from real world currency to crypto currency. You have to verify your identity, then once you’re past that phase, buy however much Bitcoin you want to invest. They have pretty steep fees at 4% but that’s the deal I’m afraid! 2. Sign up to Bittrex. Bittrex is your trading exchange, where you can buy and sell all the currencies. It’s a pretty plain looking place but it does the job. *edit 8/8/17. I initially wrote this guide by telling people to buy Ethereum then convert it to Bitcoin, because Bitcoin transfer fees were so expensive. They are cheaper now so you can send Bitcoin direct… It’s the same process. 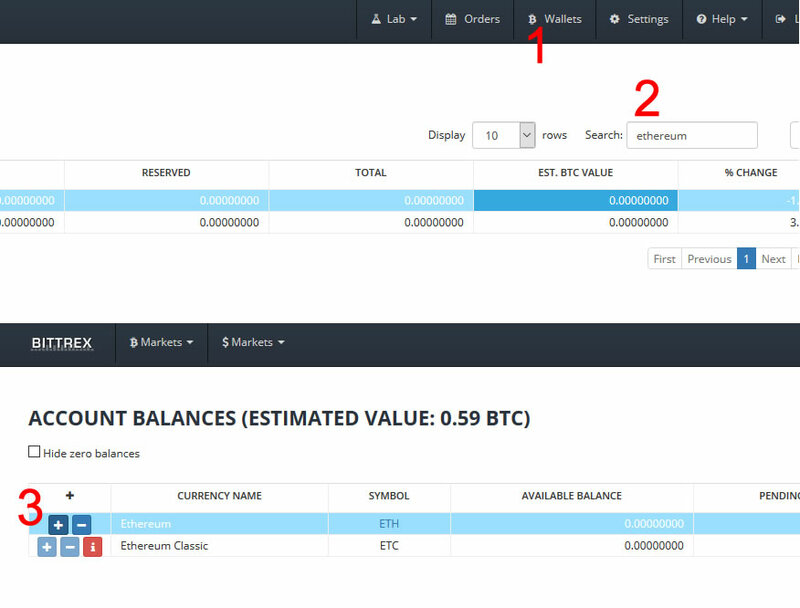 Once in Bittrex, click on “Wallets” top right, then search for Ethereum. Then click the + symbol to the left of that column. That popup window will give you a hex address. Now, back on Coinbase go to send/request. 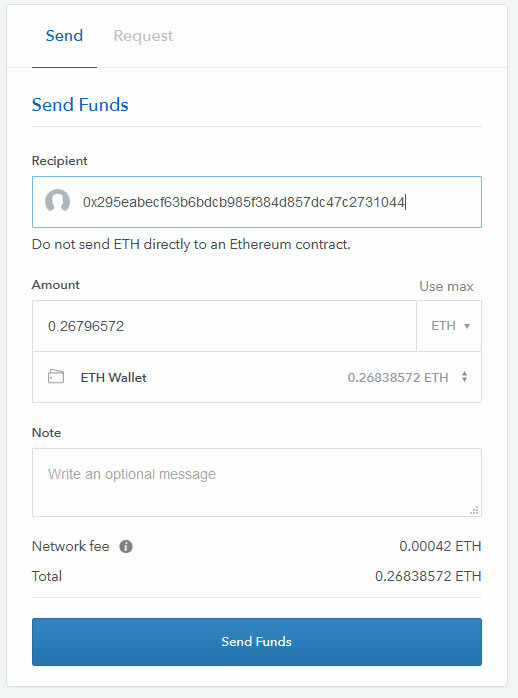 Click your ETH balance (important because the default is BTC), paste your HEX address, enter an amount you want to send and send it. Send a small amount first ($10 or so), to check it’s all working properly. After you’ve pressed send, it will take 5 mins or so to transfer over. Intially it will appear in PENDING DEPOSITS, then move over to AVAILABLE BALANCE. Everything on Bittrex is done in relation to Bitcoin. So any gains / losses in a currency’s stats are in relation to Bitcoin. Any buys and sells have to be done in Bitcoin… So, first we convert our Ethereum into Bitcoin. Back on the wallet page, click the “ETH” text in the SYMBOL column. (N.B. The reason we’ve bought Ethereum and are now converting to Bitcoin rater than just buying Bitcoin in the first place is because there are lower fees for transferring Ethereum from one location to another). That takes you to the trading page for Ethereum. Scroll down to the sell section. Click the drop down for “Ask” and click “Last” – that’s the last price at which a sale was completed. Click “Max” to sell all your current Ethereum (if that’s what you want to do), then submit. You may get an instant sale or your offer may appear in the section below, in the right hand “Ask” section. Your price will have a star next to it. The best price is at the top of the section, so if your star starts to fall down the table, that means someone else is offering a better price than you. You might have to cancel the offer and start again with a different price. You can also select the best price from the top of the left “Bids” section and just buy straight from there without having to set your own sale price. Search for the currency you want to buy, in the same way you searched for Ethereum. In this case we’ll buy some Siacoin. Click SC and instead of sell, fill out the section for buy. In the same way your offer to sell would appear on the right, now it will appear on the left. If you get a buyer, you’ll get a blue popup in the top right. Any currency you’ve bought will now appear in your wallet. That’s it! You can keep track however you like. Personally I log the USD price at which I bought the coins in a spreadsheet. I don’t really care how they do compared to Bitcoin so the Bittrex stats are largely useless IMO. I get that USD info from the worldcoinindex in linked to above. If you don’t know what to buy, you can’t go far wrong just copying the ones I’ve invested in. Today has been a good day (up about 20% on the portfolio overall) so there might be a dip tomorrow, but ultimately it’s a nice little portfolio that I’m happy with. For a list of all Crypto Currencies check out Coin Market Cap. This entry was posted in Ethereum and tagged altcoin, ardor, Bitcoin, bittrex, coinbase, Ethereum, golem, Ripple, siacoin, stratis on June 19, 2017 by MMA_Betting_Blog.